3 February 2017: Tehran’s Revolutionary Court has sentenced an Iranian woman seeking information about her niece who disappeared in Evin prison 33 years ago to two years imprisonment for the alleged crime of “propaganda against the state”, referred to her claims as imaginary. 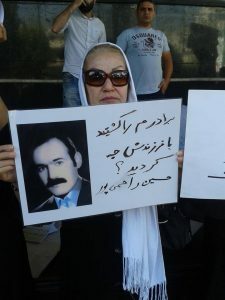 Justice for Iran has learned that the head of the Branch 15 of Tehran Revolutionary Court hinted that Raheleh Rahemipour’s participation in street protests, expressing solidarity with Mothers of Laleh Park (a group of women who lost their children as result of state violence), giving interviews and signing petitions, have contributed to his decision in giving her such a sentence. In November 2016 in a joint statement, a group of United Nations human rights experts said “the Islamic Republic must end the harassment of a woman trying to learn the fate of her brother and his new-born daughter, who disappeared from prison more than 30 years ago” . The baby, Golrou Rahemipour was born in April 1984 in Iran’s notorious Evin prison while both her parents were detained on a charge of ‘political activity’. Golrou was taken away from her mother only 15 days after birth, under the pretext of medical examination but was never returned. In September of the same year her father was executed. The father of baby Golrou, Hossein Rahemipour, was a dentist and a member of the banned Rah-e- Karegar organisation. He was arrested alongside his pregnant wife, who also was an activist. In September 1984, Rahemipour’s family received a telephone call from the prison officials stating Hossein has been “sent to hell”. The family did not receive his body or any information on the circumstances of his alleged execution or burial. The UN experts believe that a systematic campaign of harassment and intimidation has been instigated by the authorities in Iran since August 2016 against Raheleh Rahemipour. The UN’s Working Group on Enforced or Involuntary Disappearances communicated with the Iranian government about her relatives. Raheleh Rahemipour has twenty days to appeal the verdict of the Revolutionary Court.